As we step into 2015, a big crowd of people is busy making solemn resolutions for the year ahead. But we are curious about the latest fashion and our horoscopes too. 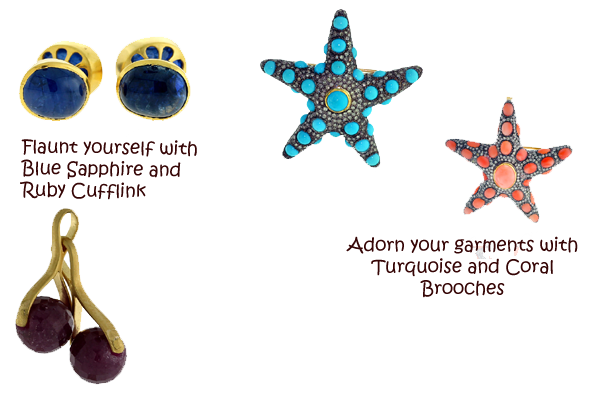 If you wish to coordinate with your mind, body and nature, adorn a jewelry that goes well with your zodiac sign. Here’s a guide on what jewel fits best with your personality. Do share the positive changes with us. People carrying this zodiac sign are fervent, enthusiastic and independent. For their daring style, red is their color. Glittering hot red rubies set in sterling silver is completely the accessory that goes with their forte. Diamonds are their favorite as they reflect their sensible and appealing personality. Agate, topaz, amber and other gems with a yellow hue are a must addition to their jewelry box. Folks carrying this sign love to update their jewelry style according to the latest fashion trends. Jewels made of silver and steel are best suited to them. Cancers are extremely sentimental and nostalgic. This is why they prefer antique pieces. Moon stones and emeralds bewitched in gold or silver can cheer them instantly. Sun being the ruler of these people; gold is the perfect pick for them. For these brave souls, anything that is big and bold would do wonders. Garnet, red coral and orange sapphire are their lucky gems. Dark colored stones such as green jade, green quartz or deep purple are quite promising for Virgos. Jewels crafted in vague silver are their lucky charm. Since balance is their forte, Librans go for pieces with a complete set of necklace and earrings. Their soft inclination towards nature allures them to pick flowery or leafy motifs. 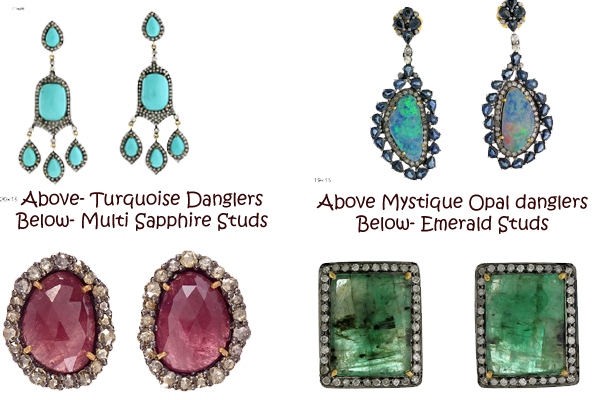 These mysterious souls must wear sensuous gems such as rubies and corals. We highly recommend silver for them. The ultimate color that sets in rhythm with Sagittarians is blue. Royal sapphire or blue topaz can impart an astonishing look instantly. Green tourmaline, emerald and black pearls are auspicious for these down-to-earth people. They are introvert, conscious and hence invest in quality designer pieces. Any mention of blue, Aquarians are in! They must carry something made out of blue such as blue sapphire or turquoise. Last but not the least comes Pisces. They love the bright shades of water, and hence blue, silver and amethyst gems are a blessing for them. A gem or gemstone is a piece of jewel which is made up of minerals, the composition of these gems makes them precious and semi-precious stones. These stones are cut and polished and are used in adorning jewelry. These stones have their respective color significance and are related to individual sun signs. Gemstones are being used in all forms of jewelry and have been a favorite among the buyers, the significance of a stone related with the sun signs play an important role. These stones are made up of different elements and hence some of them tend to be very hard some of them soft, for example- Diamonds are made up of Carbon, Rubies made up of Aluminum oxide. According to the composition of the stone, it omits different colors to list some- Emerald- green, Aquamarine-Blue, Red Beryl- Red, Goshenite- Colorless, Heliodor- Yellow, Morganite Pink etc. At Gemco Designs, array of gemstone jewelry is being manufactured and is constant demand. The jewelry is finely designed, beautifully aggrandized with gemstones in metal jewelry base. Also we are open to your imagination; you can customize your jewelry according to your wish. We offer a varied number of products which ranges from bangles, earrings, rings, pendants and necklaces. Designers at Gemco are trying their level best to produce some of unique and designer jewelry for you. This jewelry is mostly paired up with gold metal base and diamond settings, to fancify and add a grandish look to the piece precious and semi precious stones are studded. Brooches– Garment jewelry or embellished jewel pieces which are often used to adorn garments/clothing worn by men or women. Brooches are delicate pieces of jewelry which are intricately deigned and finely embellished with precious stones. Cuff link– Piece of jewelry used as to hold fast the cuffs of the garment. These are often embellished, and are beautified by gemstones and diamonds. 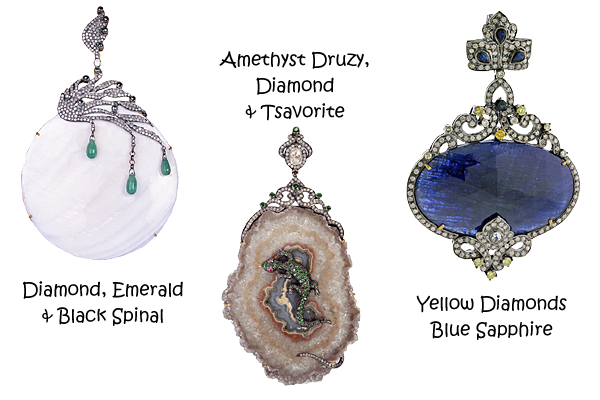 Colored sapphire stones are polished and cut and casted into precious yellow metal and chained to promptly sit on your cuffs. Bangles, Cuffs and Bracelets- Essential arm candies aren’t it? 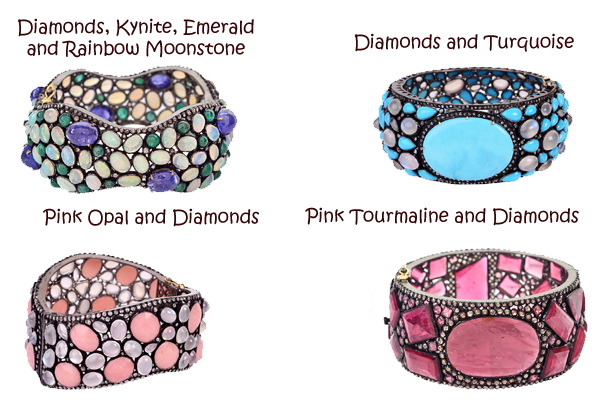 So, the curious designers have designed some gorgeous arm candies to give you that extra oomph in your jewelry attire. The precious yellow metal is often laid with gorgeous melee diamonds and gemstones to create those extravagant jewel pieces for you. Thick or thin, bangles or cuffs hand jewelry is crafted out of precious metal and is then topped off with glittery stones and tiny little diamonds, to maximize the vogue of the jewel piece. Ear jewelry- Jewelry embracing your ear lobe, is designed and crafted in many forms studs, hoops, danglers, chandeliers, jhumki’s etc. 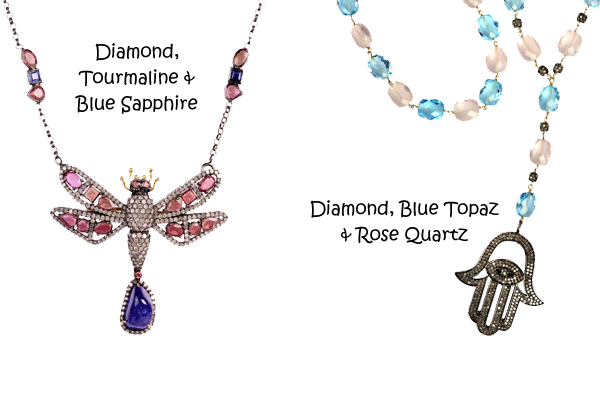 This jewelry is crafted with nonpareil designs and patterns and guilefully cushioned with polished and priced gemstones. Whatever be the form and design of the earring, sapphires, emeralds, rubies are finely fixed in the gold or silver cast and immaculately finished off with several little diamonds. Necklace– Long necklaces or short ones what do you prefer? Well whatever be your answer we cater the best in both long or short. The precious yellow metal chains pinned with some glistening rubies, emeralds, amethyst or sapphires are some exotic pieces of the jewelry from the house. Pendant- Clasps or connectors, how do you prefer your pendants? Well, the gemstones hues are spread on all sorts, we have several variants and these are elaborately designed to add grace to your neck. 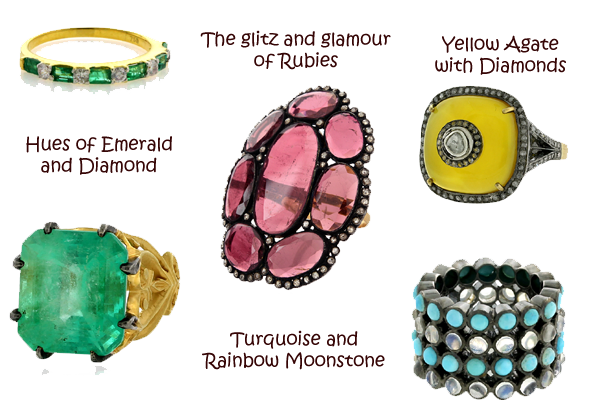 Rings– Fingers jeweled with stones speak luxury and taste. The sudden rise of rings in different forms has given yet another platform to the designers to club precious stones and decorate the gold and silver metal. Gracing the rings with turquoise, pearl, emerald has been the usual way, we at Gemco Designs like it glittery way, by honing the stones with diamonds. Browse through our website to see the variants and the exotic jewelry which will surely make you crave for all. The designs, materials and the exotic embellishments of the jewelry stand out from the regular patterns. Do drop some of your notable experience and comments.